The 2018 Dodge Challenger proclaims that you're a driver whose serious about your passion for solid American muscle cars. 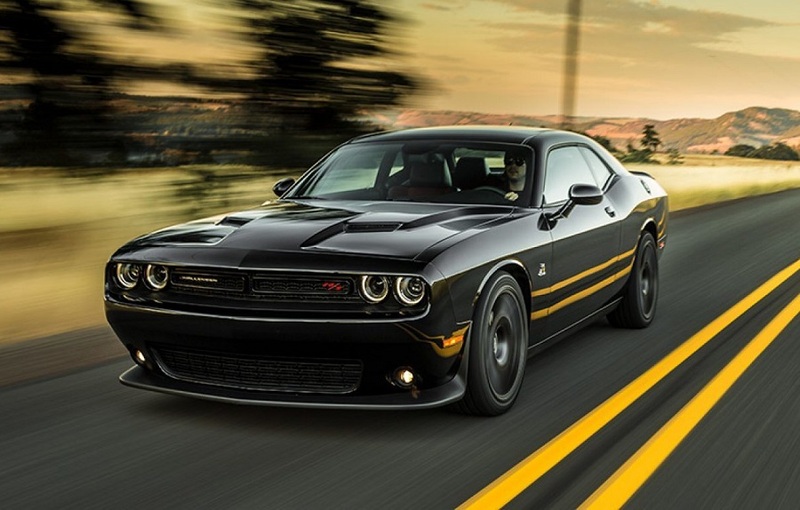 This perennial bestseller contains too many trim levels to list in this Albuquerque car guide but they include the Challender SXT and SXT Plus at the entry level, the R/T Plus and R/T Shaker in the mid-range, and the SRT® Hellcat and SRT® Hellcat Widebody at the top. You can make sure of which of the following options are available on what trims by contacting Melloy Dodge, your Dodge dealer serving Albuquerque Santa Fe Los Lunas New Mexico. When you visit Melloy Dodge serving Albuquerque Santa Fe Los Lunas New Mexico, you'll be impressed by the athletic exterior of the 2018 Dodge Challenger. You can liven up the heritage styling with colors like Yellow Jacket, Go Mango, or Octane Red. Add your own personality by opting for a variety of stripes, graphics, and badges for the hood, sides, or top. Lighting your way are round projector headlamps surrounded by quad LED halos with available projector fog lamps to break through bad weather. In the rear, LED split taillamps extended the full width of the vehicle. Many trims also include a hood scoop that not only increases sportiness but helps to cool the engine. An available spoiler improves downforce. 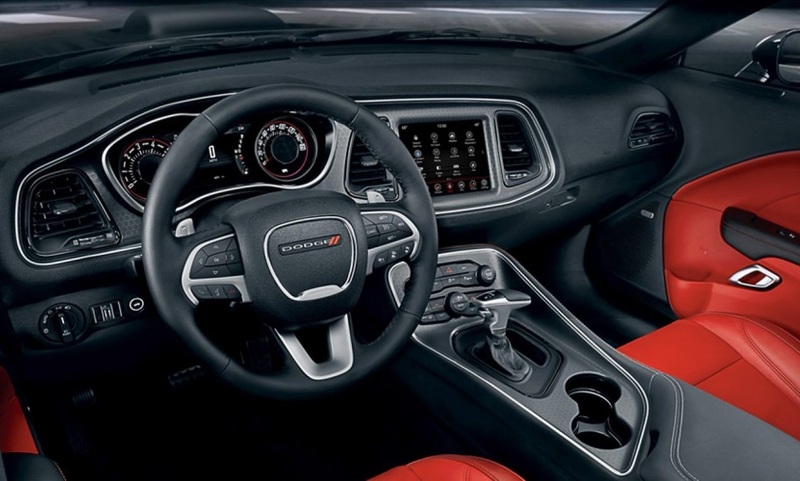 You'll get up to 16 interior choices for the 2018 Dodge Challenger in Albuquerque like standard seats upholstered in Sedoso Premium Cloth with Hounds-tooth inserts or sport seats covered in Nappa leather with Tungsten accent stitching and Alcantara® Suede on the inserts and bolsters. Up to five passengers will find plenty of space that includes 6-way power adjustments plus 4-way power lumbar adjustments for the driver. Heated seats keep the front warm in the winter while available built-in ventilation cools things down. Dual-Zone Automatic Temperature Control lets you and your front passenger create separate environments. To get you where you want to go fast, the available Uconnect® 4C NAV provides turn-by-turn directions. Make hands-free phone calls by integrating your compatible smartphone using either Google Android Auto ™or Apple CarPlay™. You'll enjoy audio from up to nine speakers with a subwoofer and a 506-watt amplifier. Control everything with full-color 8.4-inch touchscreen. Three suspension choices help define your ride in the 2018 Dodge Challenger. The Sport-Tuned Suspension includes Bilsterin® high-performance shocks, sway bars, and springs. Because it's lowered by half an inch, it enhances your experience with sporty handling. Go with Performance-Tuned Suspension and you gain independent short-/long suspension for the front and five-link independent suspension for the rear. Both offer gas-charged mono-tube shocks, coil springs, and stabilizer bars. The rear is also isolated in a suspension cradle. For top thrills, High-Performance Suspension upgrades the sport-tuned version by using high-performance shocks from Bilstein®, suspension geometry and steering knuckles. 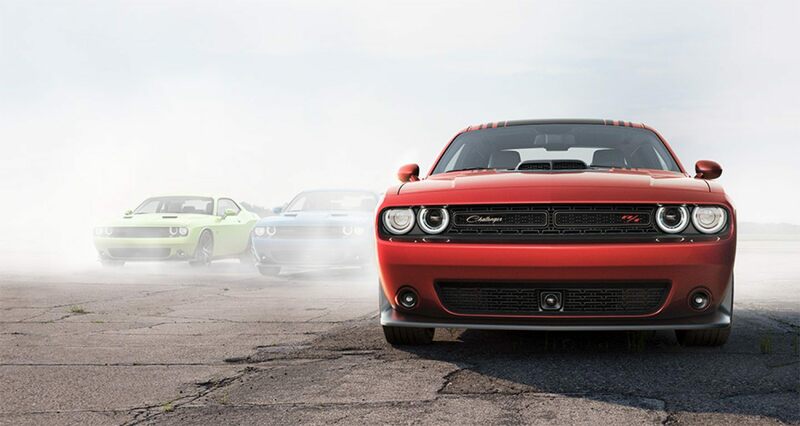 SRT® models add Adaptive Damping Suspension, which lets you choose from three modes to adjust ride performance. They include Street for typical everyday commutes, Sport that increases stiffness to improve handling, and Track to maximize stiffness and performance. 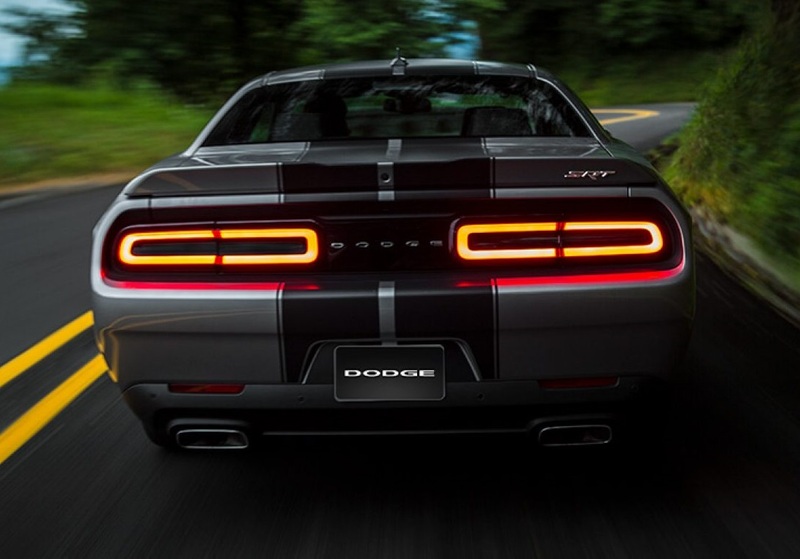 Dodge Performance Pages further refine your selections by letting you set your preferences for engine, transmission, throttle response, and steering. Your wheels are sized from 18 to 20 inches and can have such aluminum finishes as Satin Carbon, Brass Monkey, or Polished with Black Pockets. The 2018 Dodge Challenger in Albuquerque blasts off with four power powerful engine choices starting with the 3.6-liter Pentastar® V6 the uses dual overhead cams to produce 305 horsepower and 268 lb.-ft. of torque while getting up to an EPA-estimated 30 MPG on the highway. Next is the available 5.7-liter HEMI® V8 that pushes out 375 horsepower and 410 lb.-ft. of torque while reaching 25 highway MPG. Accelerating from 0 to 60 MPH in the low four seconds, the available 392 HEMI® V8 generates 485 horsepower and 475 lb.-ft. of torque. For maximum effort, the available Supercharged 6.2-liter HEMI® SRT Hellcat V8 impresses with 707 horsepower and 650 lb.-ft. of torque. 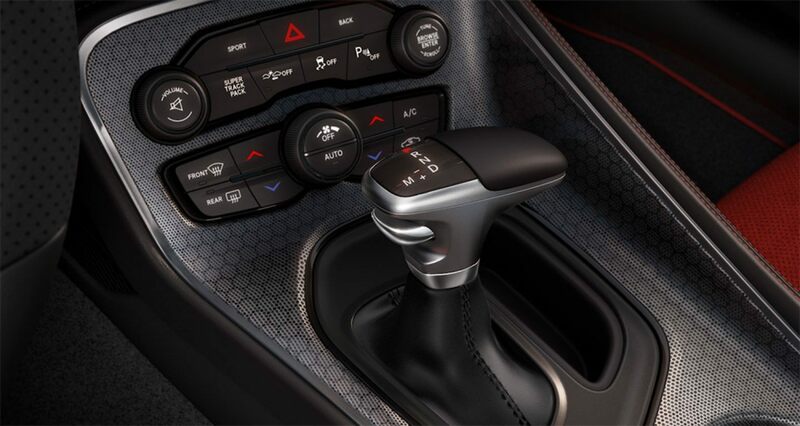 Depending on the trim you lose, you get a 6-speed transmission for a pulse-pounding connection to the road or a more convenient 8-speed TorqueFlite® 8-speed automatic transmission. Electric power steering lets you focus on maneuvering by increasing your agility. This Albuquerque car guide may surprise you by extolling the safety virtues of a car primarily known for performance. But the 2018 Dodge Challenger in Albuquerque protects your high-thrill experiences starting with the ParkView® Rear Back-Up Camera, which reveals what's behind you when you go into reverse. The ParkSense® Rear Park Assist System tells you audio-visually if you're getting too close to objects behind you. As you move forward, available Adaptive Cruise Control constantly adjusts your speed so you maintain a safe distance from the vehicle in front of you. If you're about to hit something in front, available Full-Speed Forward Collision Warning sounds an alarm and can engage Active Braking if you do nothing. When you make lane changes, the available Blind Spot Monitoring System informs you when a vehicle has encroached into your blind spot. The available Automatic High-Beam Headlamps automatically shifts from high beams to low beams when they detect oncoming traffic. Are you're ready to find out if this Dodge wonder lives up to the praises of this Albuquerque car guide? Then contact Melloy Dodge serving Albuquerque Santa Fe Los Lunas New Mexico and ask the friendly sales consultants to take you for a test drive.